AMONG the newcomers at Port Aviation, one of the most promising is a biplane of the Voisin type - but without vertical curtains - which has been built in the Clement-Bayard works. It has a lifting surface of 60 sq. metres, and is fitted with a 4-cyl. 40-h.p. Clement-Bayard engine weighing 105 kilogs. The span of the main planes is 11.6 metres, while the overall length of the machine is 11.5 metres, and the weight about 500 kilogs. It will be noticed that balancing is effected by small auxiliary planes placed between the main planes. M. Maurice Clement is experimenting with it at the Juvisy aerodrome with the idea of taking part in the competitions there during the fortnight in the beginning of next month. BIPLANE with tail and elevator. The lines resemble a combination of the Wright and Voisin systems of construction, inasmuch as the elevator, outrigger, and shape of the main decks have features in common with the American machine, while the tail is essentially a Voisin detail, albeit on this model it is not of the box-kite form. No panels are used anywhere, nor is there even a prow on the elevator. The most interesting detail on this machine is the spring-drive and gear-reduction mechanism for the propeller. The propeller itself is mounted on a kind of double bracket, one part of which is rigidly fixed to the machine, while the other rides on the first, and is anchored to the frame of the machine by a spring-suspended torque-rod. This latter bracket provides a casing and support for a spur-pinion mounted on the end of a universally-jointed extension of the crank-shaft, and this pinion is permanently in mesh with another on the propeller-boss. 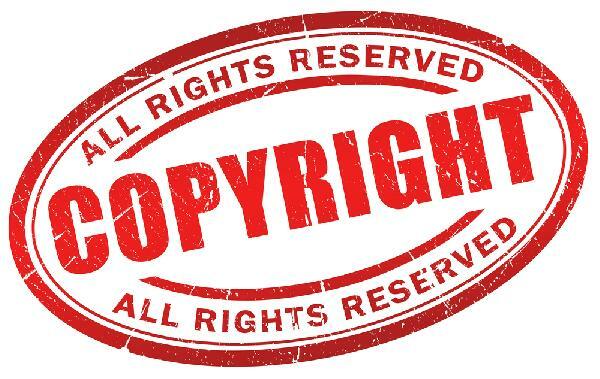 In the event of suddenly applied load, the action of the drive tends to cause the driving-pinion to "walk" bodily round the gear-wheel on the propeller, an action which is permitted to a limited extent by the spring anchorage just described. An accompanying sketch shows the general arrangement of this detail on the machine. The use of a gear-mechanism is for the purpose of adapting the engine speed to a more efficient type of propeller. The average high-speed petrol engine is commonly considered to run too fast for a good design of propeller, but on the other hand gear-reduction mechanism is in itself a source of lost power, and many makers therefore retain the direct-drive. The spring anchorage embodied in the Clement-Bayard system plays much the same part as is performed by a spring-suspended torque-rod on the modern live-axle automobile. The control of the Clement-Bayard is effected by a steering-wheel and a pedal. Pushing the steering-wheel column bodily to and fro works the elevator, rotating the wheel operates the rudder. The pedal controls small balancing planes mounted between the main decks, near the extremities. WITH his biplane, Maurice Clement has been meeting with a good deal of success, and on the 2nd he made the last two flights for his pilot's certificate. Later in the day he made four flights with passengers and then changed over to the "Demoiselle" on which he flew for some minutes. He was also flying well on Saturday last on his biplane. 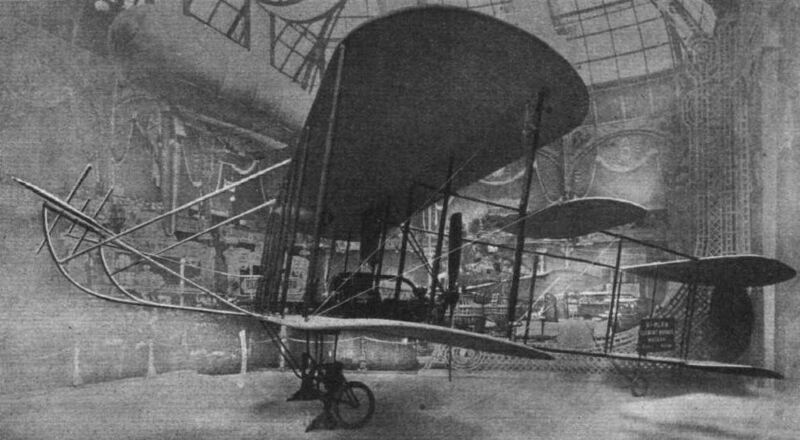 Clement-Bayard Biplane at Paris Flight Show. 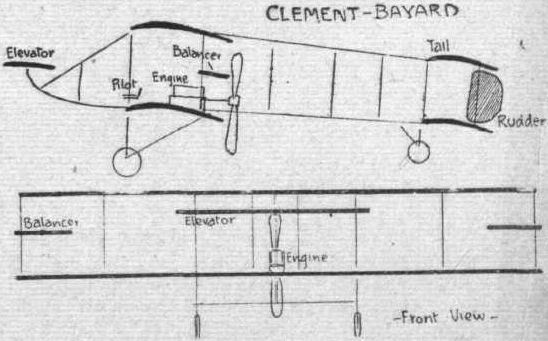 The Clement-Bayard aeroplane, which is now being experimented with by M. Maurice Clement. Maurice Clement flying at Lamotte-Breuil on his Clement-Bayard biplane. 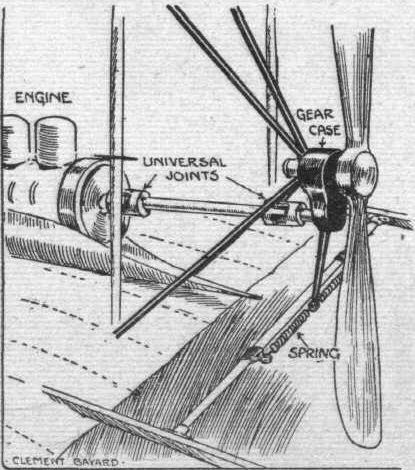 Sketch showing the gear-drive for the propeller on the Clement-Bayard flyer.